Super Bowl Sunday is not just about football – it’s the second highest caloric gorge-fest of the year, right after Thanksgiving, of course. The statistics on calories consumed are stunning. On average, we’re expected to eat 2,400 calories each just during game time. And if that number doesn’t seem high, there are plenty more stats to digest. Get ready America, things are about to get heavy. Chips and dip are often the centerpiece of any football party spread. The dips category annually benefits the most from the Big Game boon, jumping 36% compared to the previous week, with $38 million in sales. The perfect complement, tortilla chips were the runner ups in terms of net growth, posting a 35% increase, with over $107 million in sales. Potato chips remain king in terms of overall sales ($119 million), enjoying a 16% increase from the week prior. For the second year, SNAC International, the international trade association for the snack industry, examined just how many snacks Americans purchased for the Super Bowl. “The Super Bowl is prime time for the entire snack industry. Our members, including snack producers and their suppliers prepare for this monumental snacking holiday months in advance,” said Elizabeth Avery, President & CEO, SNAC International. The week leading up to the Super Bowl is huge for the snack marketers, with sales spiking as shoppers sprint to the snack aisle. Snacking is a year-round habit and an increasingly important part of consumers’ lifestyles. But year after year in terms of snack sales and consumption, only the 4th of July can compete with the Big Game. Nearly 30 million slices of pizza will be ordered from Pizza Hut and Domino's alone. Americans will eat more than 28 million pizza slices from just two of the country's biggest pizza chains, according to data from the National Restaurant Association. Add in all the local mom and pop joints as well as other national chains and you’ve got a huge number. There’s one figure that’s simply astounding. No really, it’s unbelievable. Americans slug 325.5 million gallons of beer on Super Bowl LIII Sunday. If you believe this number (we remain skeptical), every man, woman, and child—all 316 million of us—would have to drink just over a gallon of the good stuff. That’s 128 ounces, or about 10 cans. 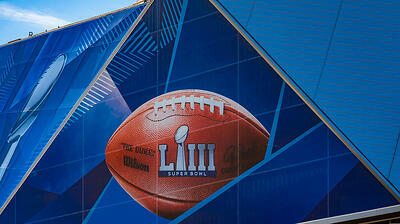 We wish you a happy and safe Super Bowl LIII Sunday. Enjoy the food and celebration with friends (plus watching the amazing commercials). When you have questions about your insurance, we’re here with good, solid answers. Sources: SNAC International, National Chicken Council, National Restaurant Association, Food and Wine.